Is Life Giving You a Pain in the Neck? Neck pain is a common complaint for many of my yoga students. Generally, muscle spasms in the neck muscles are due to poor posture, work habits, or a lifestyle that results in neck pain. We may find that we sleep with a crooked neck, hold the phone to our ear with our shoulder or work at the computer for hours with the shoulders tensed. Most people can expect to experience some degree of neck pain in their lives and often do not experience a complete resolution of symptoms. It isn’t unusual to have 50-85% recurrence within 1-5 years of the initial complaint. Less serious neck pain may be interpreted as a general feeling of stiffness and muscles aches. Chronic neck pain is associated with head and face pain, headaches, jaw discomfort, upper back, shoulders & arm pain. Tingling in fingers, achy arms, or a vice-like pressure encircling the skull may also be related to neck pain. A slumped posture that can lead to neck pain may also compress internal organs, contributing to respiratory, circulatory and digestive problems as well. Yoga postures help stretch the tight muscles and strengthen the weak ones, cultivating flexibility, stability and ease of movement. They can help to release physical and emotional blockages, facilitating in a healthy flow of prana. Yoga helps to shed light on one’s habitual stress patterns and emotional reactions. Many asanas can help to reduce stress and tension in the neck area. Here is one yoga stretch to release the rhomboid muscles. Standing Wooden Dowel Shoulder Warm-up – [Rhomboid Release] Stand in Tadasana with a wooden dowel in your hands. Place the dowel over your right shoulder & reach around with left hand to hold the lower end of the dowel behind your back. Press the wooden dowel into your right rhomboid muscle, creating pressure as you slide the dowel up and out. Press firmly into the muscles like a deep massage. Repeat several times. Then change the angle by lifting the front of the dowel up higher and repeat again for several repetitions. If you feel any “crackle,” stay there and work with it for a while. Release the dowel and repeat on the other side. 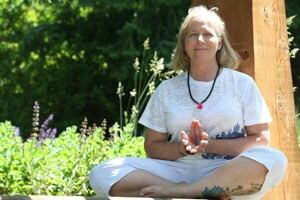 Helen Mikuska co-leads the SOYA 200 hour Yoga Teacher Training in Calgary every July with Mugs McConnell. Helen is leading a workshop on Yoga for Neck Pain March 20th, 1-5pm at Harmony Yoga Studio in Calgary, AB. This workshop includes the practice of Yogic Shatkarmas, Pranayamas, Asanas, Mudras, Meditation & Yoga Nidra. For more information please go to her website.